Ald. Judy Fiske (1st) speaks at a City Council meeting. Fiske on Monday expressed concern about a new plan to expand the downtown Evanston area. Evanston officials discussed Monday an ongoing plan to extend the city’s downtown area farther north, but concerns over the parameters of the plan prevented a final approval. The proposed plan — debated on by the Planning and Development Committee — would extend the city’s downtown area into a new North Downtown Planning Area located roughly between Ridge Avenue to the west, Sherman Avenue to the east, Emerson Street to the south and Foster Street to the north. This area includes a mix of single-family homes, student housing and businesses. Discussion about the downtown area began in part after a development bid at 831 Emerson St. was stalled last year. A developer had proposed to build a student-focused, 14-story building at a site just west of Sherman Avenue that currently houses the 7-Eleven and Lake City Cleaners, but the plan was met with strong opposition from local residents. A new plan for 831 Emerson St. was presented to officials Monday that would create a smaller, 9-story building instead. That plan will be addressed at a future meeting. Currently, the downtown area extends roughly from Ridge Avenue east to Hinman Avenue, and from Lake Street north to Emerson Street. The plan would amend the existing Downtown Plan, created in 2009, by adding five subareas to the region north of Emerson Street. These subareas would create guidelines for development in the area, such as guidelines on building heights and size. Two of the subareas would encourage transit-oriented development centered around the Foster Street CTA station, while an additional two would be “transitional” areas between the more-developed downtown to the residential areas to the north. A fifth subarea would call for “traditional” development that would match closely in size and style with the current buildings. Several residents and Ald. 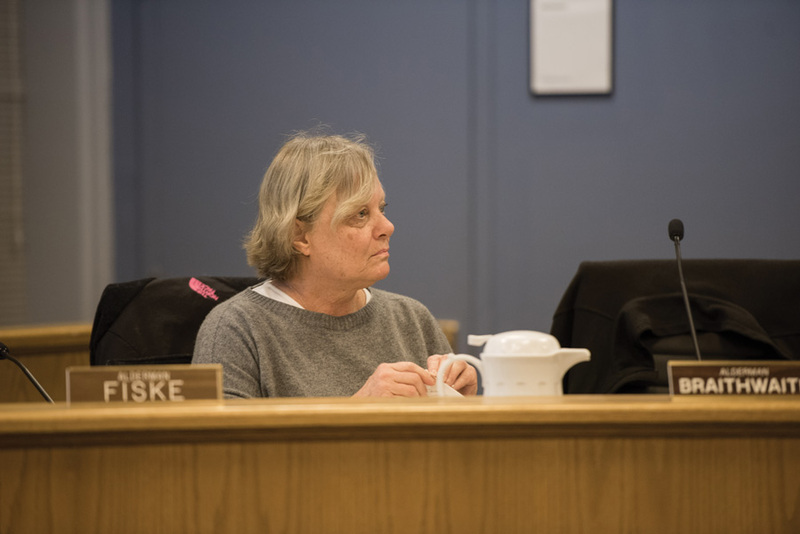 Judy Fiske (1st) — whose ward includes part of the proposed expansion — expressed concerns over the plan’s inclusion of certain properties north of Emerson Street and west of Maple Avenue. Fiske said she did not want the plan to include the areas west of Maple Avenue along Emerson Street and on the north side of Foster Street, expressing concern over how future City Councils might further expand downtown boundaries. However, city manager Wally Bobkiewicz said moving forward with the North Downtown Planning Area proposal is vital in order to address development issues surrounding properties. “Without some sort of plan or direction from the City Council will really jeopardize community involvement and jeopardize the city’s involvement in this,” Bobkiewicz said. Aldermen decided to delay action on the North Downtown Planning Area for a future meeting in order to have more time to study the plan and consider resident concerns. The Rules Committee discussed Monday the city’s advertising policies and expenses after some residents requested the removal of city ads from the news website Evanston Now. A Change.org petition, published in January, called on a number of Evanston businesses to cancel their advertising on Evanston Now’s website, criticizing the site “for reporting that exacerbates racial injustice in our community” and its moderation of the comments section. Evanston Now is a local online news site founded by Bill Smith (Medill ’70, ’71) in 2006. Smith also serves as editor of the site. “(Evanston Now has) blamed the victims of racism for their victimization, reinforced racist myths, used racially insensitive language, and published incendiary, racist (comments),” the petition reads. During Monday’s meeting, assistant city manager Marty Lyons outlined how much money the city allocates to ads in Evanston RoundTable, the Chicago Tribune’s Evanston Review section and Evanston Now. Lyons said the city spent about $59,000 on ads for legally required notices and city services and events across all three publications in 2016, with $1,752 going to Evanston Now. Lyons also mentioned city advertisements in The Daily Northwestern but did not review them in detail. Ald. Brian Miller (9th), who brought up in March the issue of advertising in Evanston Now, said he would like the city’s equity and empowerment coordinator, Rev. Dr. Patricia Efiom, to examine the city’s advertising guidelines. “We don’t have standards for where we are spending dollars,” Miller said. Efiom said she met with the concerned parties about the Evanston Now issue and determined that halting advertisements on the site would not be the best action. She said she will, however, bring different groups together to develop guidelines on city advertising in publications. Fiske and Miller said they have heard about people being blocked from commenting on Evanston Now’s website, a practice said was concerning. “We impose restrictions on what people will say and what they’ll be allowed to say, because we maintain some community standards,” Smith said. Mayor Elizabeth Tisdahl said the city puts itself “on a slippery slope” when it starts to decide in which publications to place its advertisements. “I hope we will not go into the land of trying to control the press,” she said.